This is the only web site that records the complete bibliography of the famous First World War soldier, poet and writer, Siegfried Sassoon. Illustrated here are all the books and pamphlets published by Sassoon in his lifetime; any contribution he has made to other books such as introductions and forewords, and any of his work published by others in his lifetime such as the inclusion of his poems or other work in anthologies etc. In addition to the information regarding books, I have created a number of pages containing details of Sassoon’s life, and those of many of his friends and relatives. Some of this has been new research on my part. All books illustrated are from my own collection and are listed in order of the date they were published. I have also included on the site books from Sassoon’s own library, books in which people have written about Sassoon in his lifetime and also modern books written about him after his death, in particular biographies which may be of interest to those wishing to find out more about him. The books on the left cover Siegfried Sassoon’s ‘Sherston Trilogy’ and his ‘real’ autobiography. Many of Sherston’s experiences were Sassoon’s as well, and he left much out of his second trilogy because he had already covered it with Sherston. Click on the titles to see a short synopsis of each book. 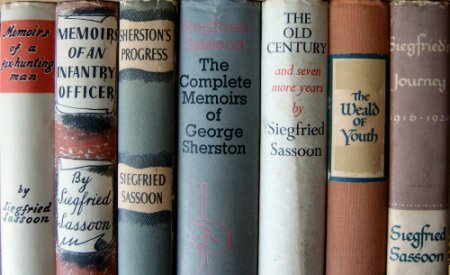 Although ‘The Complete Memoirs of George Sherston’ was published, there was no single publication of Sassoon’s ‘real’ autobiography. Keynes - Bibliographer and close friend of Siegfried Sassoon, Geoffrey Keynes, wrote a bibliography of Sassoon’s work which was published by Rupert Hart-Davis in 1962. This is a wonderful book but unfortunately it is incomplete. For instance it does not cover any books from 1962 to Sassoon’s death in 1967. Siegfried Sassoon was a complex character, full of contradictions and although he had always wanted to be a famous writer, when Keynes suggested he write his bibliography Sassoon was not particularly happy about it, thinking it would intrude on his privacy. However, Keynes was undeterred and began his work and it wasn’t long before Sassoon was providing him with more and more information. Keynes had Sassoon’s own library from which to carry out his research and he also had a number of his own books to collate. However, many books, particularly anthologies, went unrecorded and this web site brings more of them together for the first time. I have used Keynes own numbering system but where books are not in his bibliography I have noted that they were Not Collated. Some other books are not covered in depth by Keynes but merely mentioned in the larger descriptions of other more well-known titles. Where this is the case I have noted that they were Mentioned. Sassoon Books These are broken down into seven categories which record the books that Siegfried Sassoon wrote himself, comprising of his early poems, autobiographies both fictional and real published in the UK, US and Europe. His poetry published in the UK and the US., and other publications which in this case comprise of his biographies of Meredith, published in the UK and US. Contributions There are three categories in this section, books in which Siegfried Sassoon has contributed the Introduction or Foreword. Pages covering the six decades in which his poems were published by others, (mainly in anthologies) from 1917 to 1967, and books in which he has contributed other texts, mainly excerpts from his autobiographies. About Sassoon These are books which contain information about Siegfried Sassoon, written during his lifetime. The books are written by such famous names as Edmund Gosse, David Garnett and Frank Swinnerton. Also included are two books by the renowned bibliographer Geoffrey Keynes. Keynes wrote Sassoons bibliography which has helped enormously in the creation of this web site. Catalogues An interesting section which covers auction catalogues relating to Siegfried Sassoon’s work. These catalogues give a fascinating look at the library of Siegfried Sassoon when it was sold off after his death and scattered around the world. Sales include Sassoon’s work from the collections of Lady Ottoline Morrell, Stephen Tennant and Max Beerbohm. Periodicals This section covers magazines and periodicals in which Siegfried Sassoon has had his work published or contain stories about him during his lifetime. They include limited runs such as ‘The Owl’ edited by another famous war poet, Robert Graves, and magazines of larger circulation such as the American publication, The Literary Digest. Book Reviews These contemporary reviews of Sassoon’s books are taken from various literary magazines of the time, the title of each is acknowledged along with the date of the review. I believe that these reviews are important today as they are unbiased and show just how Sassoon’s books were received at the time they were written. It also gives people who are new to Sassoon a glimpse of what each book is about. His Library An interesting and varied selection of books in my possession which once formed part of Siegfried Sassoon’s own library. Many are inscribed to Sassoon by well known people such as Edmund Blunden and H. M. Tomlinson. 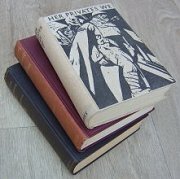 These books were auctioned off after Sassoon’s death and have re-entered the market at various times since enabling me to purchase them and add them to this web site. Sassoon Biography A short, one page biography of Siegfried Sassoon. This biography has been created as a tiny window into the life of the great poet and writer. Elsewhere on this web site will be found more information about his life and his friends which will go to build up a complete picture of the poet, writer, soldier, hero, country gentleman and lover of an English way of life long since past. A Soldier’s Declaration This is the Hansard report which covers Sasssoon’s Declaration which he wrote in 1917 and sent to a sympathetic MP to be read out in the House of Commons. Sassoon had wanted to do something to shake the establishment at its heart and to speak out about the insincere way in which he thought the war was being pursued by the British Government. It covers the Commons Debate and his Declaration. Sassoons Art A new page which showcases some of Siegfried Sassoon’s little known paintings and sketches. Siegfried Sassoon enjoyed sketching and painting and often made drawings in the front of books and sent them as gifts to his friends. He also produced watercolour paintings and caricatures of friends and acquaintances. Keynes A short, one page biography of Sassoon’s bibliographer, Sir Geoffrey Keynes. Geoffrey Keynes (pronounced “Canes”) maintained a passionate interest in English literature all his life. He produced biographies and bibliographies of English writers such as Sir Thomas Browne, John Evelyn, Siegfried Sassoon, John Donne and Jane Austen. His Sassoon bibliography has helped me enormously. Robert Ross Siegfried Sassoon first met the art expert and literary critic Robert Ross in June 1913, at a party given by Sir Edmund Gosse. Ross, eighteen years older than Sassoon, was a patron of emerging actors, poets and writers and had a significant effect on Sassoon’s work by encouraging him to write poetry critical of the military hierarchy. Eddie Marsh The writer, Sir Edward Marsh, arts patron, poetry publisher and private secretary to Winston Churchill among others, who Siegfried Sassoon first met in 1913, was enormously influential in furthering Sassoon’s career as a poet. While visiting Marsh at his flat in 1913 Sassoon declared that he wanted to move away from his family home ‘Weirleigh’ in Kent, where he lived an aimless life with his mother, and Marsh immediately suggested he move to London. Massingham H.W. Massingham was the editor of the Nation, a leading British radical weekly newspaper, between 1907 and 1923. Massingham published a number of Sassoon’s poems in the paper during these years. He was highly enough thought of by Sassoon to be asked his advice before Sassoon went ahead with his protest and was one of the people to whom Sassoon sent a copy of his original statement at the time. Crosland A page about the first editor to commercially publish Sassoon’s poetry. In the spring of 1909, having had limited success in getting his work published, Siegfried Sassoon was looking for other publications to contact and sent some poems to T.W.H. Crosland the editor of the journal, ‘The Academy’, who was himself a poet and whose work Sassoon respected. Robert Graves served in the same battalion as Siegfried Sassoon and they became great friends. Graves was also a talented war poet and had ‘helped’ Sassoon during the period of his protest by convincing the army authorities that Sassoon was suffering from shell-shock, and ought to be confined to a hospital rather than be court-martialled for his refusal to fight. Sassoon had not asked for, nor appreciated this intervention. Sir Max Beerbohm, caricaturist, writer and broadcaster was one of Siegfried Sassoon's literary heroes. They first met in 1916 at the London home of critic and autobiographer Edmund Gosse and since then Sassoon had been sending Beerbohm his privately printed books as a token of his esteem. In 1910 Beerbohm and his wife Florence moved to Italy and settled at the Villino Chiaro, on the Via Aurelia just outside Rapallo. Norman Loder was one of Siegfried Sassoon’s greatest friends. He was Master of a number of Hunts including the Southdown in Sussex, the Atherstone in Warwickshire and Fitzwilliam in Cambridgeshire. Loder instilled in Sassoon a great love of the sport. Sassoon finally outgrew Loder as he became more interested in literature and writing. However, Sassoon never forgot and wrote about his experiences with affection. Hester Gatty Edith Olivier introduced Sassoon to Hester in 1933 and to the surprise of many people, they were married later the same year. In 1936 they had a son, George, but the marriage would not last. Sassoon, too used to living on is own terms felt smothered by Hester’s attention and in 1945 they had separated, Hester leaving the family home, Heytesbury House, in Wiltshire, eventually to live on the island of Mull. The Hanmers Siegfried Sassoon met ‘Bobbie’ Hanmer and his cousin Dorothy while riding with the Atherstone Hunt before the war. Although he was deeply attracted to Bobbie, Sassoon never did develop a relationship with him. However, Dorothy was attracted to Sassoon and in an effort to get close to Bobbie he was happy to cultivate a friendship with her. Three Aunts The book featured on this page is a copy of the ‘Rubaiyat of Omar Khayyam and the Salaman and Absal of Jami,’ published by Bernard Quaritch in 1879. The book was given as a gift to Louise Sassoon from her sister Rachel in 1889 and carries an inscription. Louise Sassoon and Rachel [Beer] were both aunts of Siegfried Sassoon and this page contains some details about them. Also, books belonging to Mozelle Hyeem. Godbert’s Godbert’s Restaurant does not play a huge part in the story of Siegfried Sassoon, although he did visit it a number of times while on leave from the front line trenches. However, on trying to find out more about it I discovered that very little is known, and therefore I have created this page. This wonderful old restaurant used to stand on the Rue de Jacobin, Amiens, Northern France, and finally closed its doors in 1973. Edingthorpe As a child Sassoon spent many a happy holiday with his mother and brothers at the old rectory in Edingthorpe, Norfolk. In 1937 he revisited the village and wrote about his memories in ‘The Old Century and Seven More Years’ , I visited Edingthorpe in 1994 and took the pictures found on this page making reference to their part in Sassoon’s story. 1924 Road Trip In 1924 Siegfried Sassoon was living at 54, Tufton Street, London. On the 6th September he decided to drive to Malvern and visit his great friend, the Neurologist, Henry Head. On this page I have listed all of the places that he passed through on his driving tour, or ‘Road Trip.’ Also, I have included pictures of the hotels that he stayed at overnight or stopped at for food during his journey. Letters Shown here are letters I have relating to Siegfried Sassoon. These letters have either been written by Sassoon, or written by his friends and associates to him or to other people within his circle. Included is a letter written by Sassoon to a lady suggesting she buy a house in Heytesbury; and others written by Sassoon’s friend Robert Ross, H W Massingham, Geoffrey Keynes, Sir Edward Marsh, and others relating to Stephen Tennant. Weirleigh Weirleigh was a rambling neo-Gothic house, built alongside the road at Gedges hill, just North of Matfield in Kent. It was designed by the illustrator Harrison Weir in 1866 for his own use. Weir eventually sold it to the Sassoon family and Siegfried Sassoon was born there in 1886, the house becoming the family home until the death of Sassoon's mother, Theresa, in 1947. Heytesbury In 1933 Sassoon bought Heytesbury House, a Georgian mansion surrounded by 90 acres of parkland and 130 acres of woods just outside the village of Heytesbury in Wiltshire. Sassoon was living here when he died and the site is much changed now. This page shows how it was at the time, and what has happened to it since. Mells Siegfried Sassoon died in 1967 a week before his eighty-first birthday. He had made it known that when he died he wished to be buried in the church yard at Mells, Somerset, close to the grave of Father Ronald Knox. Knox had been a Roman Catholic priest who preached at the church in Mells and who helped Sassoon to convert to Roman Catholicism. America On 28th January, 1920, Siegfried Sassoon arrived in New York. “A lecture tour seemed a way to escape and make money, not only for himself but to help his friends who, imagining him to be rich - because of his name - turned to him often.” (Egremont, Sassoon, 2005, p241.) Here are two reports of lectures given by Sassoon in New York at this time. Who Was Whom? The people in the Sherston Trilogy were all real, however their real names were not used and Sassoon gave them each a pseudonym. This page gives the pseudonym and the real names of all these people, including a number of place names that feature in the three books. Most of this detection work has been done by others to whom I offer acknowledgment on the page. Contact Hello, my name is David Gray and I created this web site. Please contact me from this page. I first became interested in Siegfried Sassoon when I picked up an old copy of Memoirs of an Infantry Officer in an old bric-a-brac shop in Peterborough where I live. I find Sassoon incredibly interesting not just for his writing, but also for his amazing bravery, both physically on the battlefield, and morally with regard to his protest. Links Web sites which may or may not relate to Siegfried Sassoon but could still be of interest to others. These sites include a number which refer directly to Siegfried Sassoon, and others with a military theme relating to the First and Second World Wars. Subjects include the French Resistence in WWII, soldiers who fought in the First World war, and local sites about the city in which I live, Peterborough, Cambridgeshire.